Reignite that excitement with breakfast for dinner at camp. Not only is a hearty breakfast after 5pm a great mood booster, it can fuel your adventures for the rest of the day. Try these energy-packed B4D recipes and seize the day, breakfast style. Breakfast for dinner can be as simple or complicated as you want to make it. These tools of the trade will help you achieve premium B4D status. 20 Steel Skillet - Cooking for a group of guides the size of a football team? Grab this skillet and leave no one hungry. Packed with protein and potassium, banana pancakes are the perfect pre-adventure meal without weighing you down. No longer just a Jack Johnson song, although we do recommend a little jam session while the cakes cook. Mash the bananas until creamy, then add eggs and protein powder and whisk. Grease a pan or griddle on low heat. Pour desired amount of batter in the pan and cook until brown on both sizes. Drizzle syrup over pancakes or add fruit if desired. For more protein, top with peanut butter or nuts. Serves 2. Yes, you can have waffles while camping. Pack your Bugaboo Waffle Iron and cook your fluffy syrup receptacles over the stove or campfire. Or kick it up a notch and make these protein packed sandwiches (sandwaffles?). Prepare waffle batter according to package directions. Spoon into the Bugaboo Waffle Iron and press down to cook, flipping halfway through. While your waffles rise, place three strips of bacon in a hot pan and sizzle. Remove waffles from iron and slather peanut butter on one side of each waffle. Place cooked bacon in between each waffle slice for a waffle sandwich. Drizzle with syrup and enjoy with a fork or dig right in with your hands, we don't judge. Pretend you're traipsing down the Champs-Elysees instead of chomping down your dinner with a little campsite French toast. Whisk together eggs, cinnamon, vanilla, and milk until well mixed. Using a fork to help, briefly dip both sides of each bread slice in the mixture so the bread is wet but not soggy. Fry on a hot pan or griddle until toast is golden brown and egg is cooked through. Transfer to plate and drizzle with syrup, top with fruit, or spray that whipped cream. Serves 4. Bon appetit! 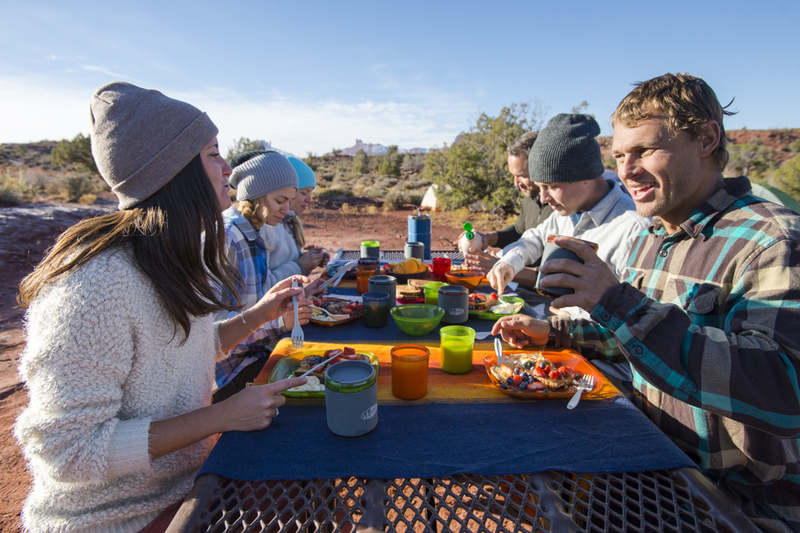 Dinner doesn't have to be boring, and it doesn't have to weigh you down before dawn patrol. Fill up with breakfast for dinner the night before a trip and enjoy your energy all day long.